Environments and Creativity – Why Not in Political Discourse? A little over a year ago I blogged on optimizing your environment for creative output. I also wrote about the pros and cons of open office plans. …Researchers at Ohio State University and the National Institute of Mental Health tracked 60 white-collar workers at a government facility in the central U.S. Some had been randomly assigned to an old office building, with low ceilings and loud air-conditioners. The rest got to work in a recently renovated space filled with skylights and open cubicles. For the next 17 months, the scientists tracked various metrics of emotional well-being, such as heart-rate variability and levels of stress hormone. They discovered that people working in the older building were significantly more stressed, even when they weren’t at work. The scientists said the effect was big enough to be a potential risk factor for heart disease. All this got me thinking about how early philosophers and politicians carried out their discussions in open air forums, surrounded by fresh air and blue sky. They dreamed of ways of improving the world, becoming better people, and their imaginations would soar. We are indebted to their innovative thinking still, today. While recently thumbing through an issue of Woman’s World magazine, it dawned on me that Woman’s World is a repository of positive deviance (And consequently is a database of possible business opportunities!). In fact, Woman’s World’s Mission Statement emphasizes that their goal is to provide practical everyday solutions for work and home. This also includes solutions for health and beauty. They make it a point to amass and share tidbits of information – helpful information that others may not have thought of or had access to. These insights come from women who have the same resources and face the same challenges and obstacles as the readers of Woman’s World. In fact, many times it is readers that contribute! For a buck seventy-nine you get, as the magazine claims on every cover, “A Great Week Made Easy!”. You also get solutions to problems (that you often didn’t realize you had until you saw them printed), and you feel better about yourself because you’re making an effort to change (i.e. design) your life, and the lives of those around you, for the better. How does Woman’s World do this and what can you do to build a system for sharing positive deviances? Follow each of these four rules and you’ll be on your way. People need to have easy access to the repository. Woman’s World is usually placed in the check out aisles. People get it while they’re waiting to do something else! It also means that it should be easy (and even fun!) to read, easy to navigate. Information shouldn’t be presented as long drawn out treatises, but as short and sweet pericopes. People need to see themselves as belonging to a community in which they can share their problems and solutions without judgement. The members of this community share a common goal: the growth and/or improvement of individuals, families and communities. The repository needs to address what is important to community members. This goes beyond obvious systemic needs (how to do x,y,z more effectively) and includes things like spirituality, health/wellness, etc . DON’T CANONIZE ANY PARTICULAR CONTENT OF THE POSITIVE DEVIANCE REPOSITORY! Once you start getting a Positive Deviance Repository in place, don’t forget to experiment and improve on your system. Violating either of these guidelines will result in stagnation of your system, or worse, alienation of the system’s users. Positive Deviances are proposed and adopted from the ground up. If they’re imposed from the top down, they will often lose their efficacy. You want people to be active and engaged in reading and contributing to the Positive Deviance Repository. After all, who wouldn’t want their customers/members to contribute to the growth of the company and/or society, and for them to feel better at the same time? These are all great things but there is a problem with this package. It’s a problem that stems from companies getting so excited about technology that they forget about how customers will use the product and how that helps create their experience. Why would she say that? KFC’s sides consist of mashed potatoes and gravy, macaroni and cheese, cole slaw, baked beans and green beans. Some of these are served hot, others are served cold. If you buy a single piece meal, you will receive a piece of chicken, a biscuit, and your choice of two sides. Order two hot sides and there is no real problem; everything in the box is hot. However, order one or two cold sides and there’s a very real problem. The chicken, biscuit, and sides (Cole slaw and Mashed Potatoes/Gravy in my case) all get packed tightly in a small cardboard box. If cold side servings, like cole slaw, are in the box, they get warm…really quickly. If the drive home is more than a couple of minutes, the cole slaw (or cold dish) will become warm, sometimes disgustingly so (unless you like warm cole slaw). KFC says this is their best packaging idea since the bucket. Actually, the bucket did a great job as a package. Because all the hot/warm chicken was lumped together in the bucket, the chicken stayed pretty warm. It was also a great way to serve the chicken; just reach in and grab a piece. The bucket was, and is, a good idea. It’s great for the environment but it doesn’t deliver on basic functionality, and that translates to a lousy culinary experience. People don’t go to KFC to replenish their container stash at home. They go there for the food – for hot chicken, warm mashed potatoes and gravy, and cold cole slaw. I look forward to packaging improvements that not only benefit the environment, but win awards because they actually preserve, and protect the food for the trip home. After all, that’s the real need. It’s such a simple concept really. Maybe that’s why it was forgotten. This is a great, inspiring short interview with Andrew Pek, CEO of ivibeglobal.com. Thanks to Kristina Loring of Frog Design for the interview and her update of the 2011 FUSE Conference. Thoughts between thoughts, space between words, reading between the lines. We think that if we listen to everything said, we’ll learn all there is to know about someone, or some situation. However, it’s understanding what’s going on in the gaps that drives creativity and propels innovative interaction. Gaps need to exist for interaction to take place – gaps in speaking, reasoning; gaps between sketches on a white board and sketches in our minds. Watch for gaps; listen for spaces. Feel the pause between the lightning and the thunder, and watch the sparks of creativity fly! Are they the things you feel? are what make the sentence real. All the things I don’t say. Are they the things you see? of silence that you heard. Pick a group (and/or individuals) as your Implementing People (IP). Walk your way around the map asking the questions in bold with reference to your IP. Repeat steps 1-2 for every entity in the organization. If you can’t really answer a question, it shows that your organization is most likely weak in that area. Make sure that you actually have data of some type to back up your answers. If all you have are your opinions, (as in, “Those people don’t need to have access to the order system. Why would they?”) that’s a problem. Some definitions are in order. 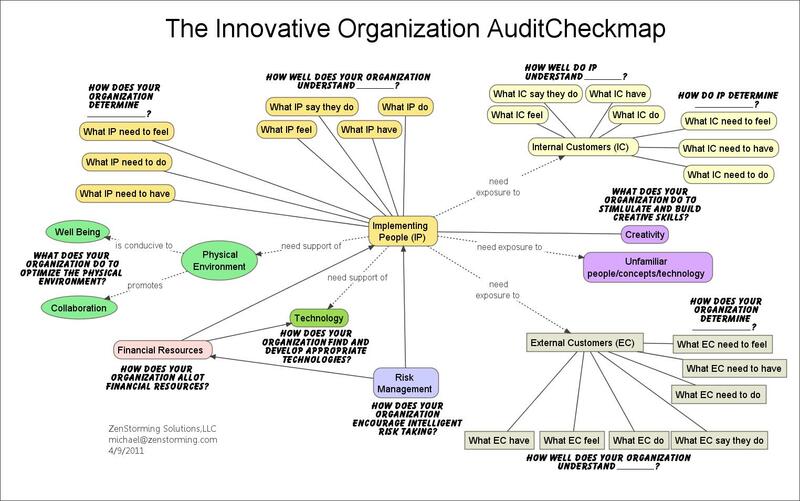 Implementing People (IP) – This represents anyone (or group) that is doing a task, whether it’s people in the C-Suite, Finance, R&D, Operations, etc.. It’s intentionally vague but it’s put at the center of the map as it is the starting point for an innovation audit. Pick a group you want to analyze and they are your IP. Internal Customers (IC) – These are people the IP interact with on a regular basis. This can include stakeholders. External Customers (EC) – These are your customers, users, patients, clients. They are people or organizations that are not part of your organization. They are people you serve or provide products to. Each group has needs. They’ve been broken down into, ‘What they need to feel,’ What they need to do,’ ‘What they need to have.” These are distinguished from what they actually feel, do, and have. The phrase, “How does your organization determine ‘what IP need to feel’?” means, “How does the organization determine the affective needs of the IP?” For example, individuals in a certain group may need to feel wanted, feel pride, feel challenged, etc. Also, disconnects between what people need to feel and what they are actually feeling, or what they need to have and what they actually have, are signs that something is amiss. I’ve also included a question regarding understanding what people say they do in addition to what they are actually doing. If these aren’t the same, that’s an issue. Another way to look at this map is as a source of metrics for gauging your innovation effectiveness. Traditionally, most metrics are in the financial realm (ROI, Gross Profits, etc.) with a few from the Creativity side (Number of patents, etc.). Push your organization to have metrics of some type for each node/question in this map. This chart can also be used as a culture change guide. Changing how nodes work and the relationships will impact your culture. Any questions or comments are welcome!